There have been a few attempts to create autonomous house robots which can carry out everyday chores like folding our clothes. A new robot created by Japanese company Mira Robotics puts a slightly different spin on things, however. 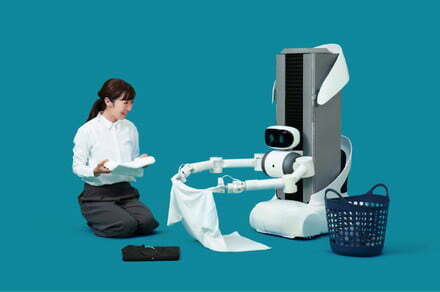 They have developed a robot called Ugo, designed to help carry out a variety of household chores. The catch? That it’s remotely controlled by a teleoperator. In other words, it’s a bit like hiring a housekeeper with the difference that they never physically visit your home, but rather remote control a robot for a few hours each week. This isn’t the first telepresence robot that we’ve covered. Telepresence robots have been used to make it possible for people to unwell kids to attend school — and even graduation ceremonies. Japan, meanwhile, recently tested an unusual cafe concept where diners were served by robot waiters operated remotely by paralyzed individuals, who controlled the robots from their own homes. In the case of the Ugo robots, each bot is equipped with three cameras, a microphone, speaker, Wi-Fi, and LTE connectivity. While it’s quite limited in its movement (it can’t climb stairs, which will mean installing a ramp if you want it to freely move about your home), it does appear to be quite dextrous. As seen in the video up top, tasks that it is capable of include folding items of clothing, hanging up wet clothes, and potentially more. According to a report from the Institute of Electrical and Electronics Engineers Spectrum, the business plan for Ugo is that customers will rent it on a monthly basis for between $180 and $225 per month. Customers will then book in human operators to carry out work tasks for however many hours per week they need it. It’s not clear whether this cost will be included in the rental price or if it will be extra. The human operator will log in to teleoperate your robot for the number of hours or task required, before disconnecting again at the end. Long-term, the company hopes to start exploring autonomous actions on the part of the robots as well. There’s no exact timeline for when all of this will be available to customers around the world. However, Mira supposedly plans for beta testing to begin in the near future. Full-scale deployment is hoped to begin sometime in 2020.